Blame It On Fat Tuesday. I had the hardest time photographing this one. It's not quite so teal/blue as it looks, it's really more green. In fact, it looks a lot like another impossible to photograph polish: China Glaze Four Leaf Clover. Jester Ate The King Cake. This is the collection of the impossible to photograph polishes. Another reason these took me so long to post. This is a light yellow creme with a really strong green tone. Think of OPI Fiercely Fiona or maybe a creme version of Nicole Lemon Lime Twist. Yellow green. Or really, green-yellow. Party In The Masquerade. 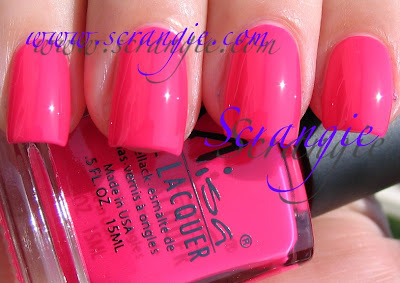 Pretty, punchy medium neon pink. I like these types of pinks. Shake It To The Samba. This is a soft peach-orange color. Very peachy, a little bit like a cross between Essie Tart Deco and Van d'Go. Peachy, orangey, soft, creamy. Single and Ready To Limbo. Medium bright red creme. Not too light and not vampy. Throw Me Something Purple Please. I can't tell you how frustrating this was to photograph! It still doesn't look right. It's more purple-ish than this. But really.. it's not purple. It's blue with a purple tinged look... I don't know how to describe it. One of those impossible blue-purple colors like Color Club Puccilicious, looks different depending on the type of lighting... Kinda makes my head hurt just thinking about it. Haha! Very pretty though. The formula was very thick and very opaque. Two coats on all of these except Jester which is three. Drying time is very long, probably due to the thickness. Some of my brushes had stray hairs, too, so you may need to check your bottles and trim as needed. Overall, I'm not sure how I feel about these! On one hand, I do like the colors, they're pretty and bright and definitely colors I like to wear... but on the other hand, I just didn't feel that usual wave of happiness and excitement when I swatched these. Not a bad collection at all- lots of bright fun colors, but I just didn't feel like it was unique or characteristically "Misa". Misa's fall collection seems much more "Misa" than this one. This is also another all-creme collection... If I'm remembering correctly, the last three collections (year and a half, right?) have all been creme with the What I Like About You fall set finally breaking the streak? I feel like Misa has changed so much since the days of duochrome glory. This is a nice collection! I still enjoy seeing the colors! 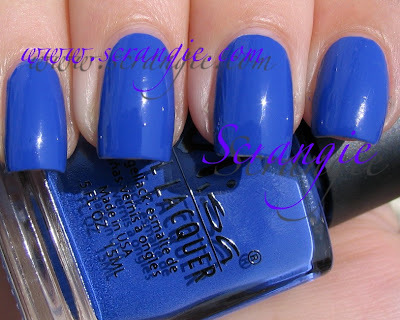 Those are pretty and I agree with Lacquer Wear, it is nice to see bright and happy shades popping out among the deep Fall shades. Throw Me Something Purple Please is absolutely stunning! That peach shade looks delicious like peach ice cream. Can you tell I'd like to have some peach ice cream. The purple and teal are really pretty. Nothing very different but nice shades. I really do love your site! Your EOTDs- stunning! Great swatches! I'm in love with Blame it on Fat Tuesday and Throw Me Something Purple Please... Don't love the names though. Can they make them any longer?! The swatches are gorgeous as always! You'd thinkk they'd make a deeper purple for mardi gras though, right?